Stonetusk Boar and Desert Camel works pretty well with this in Wild. Is it me, or is that bear throwing a mean Dab? Too slow for card-drawless midranged hunter decks in order to work. 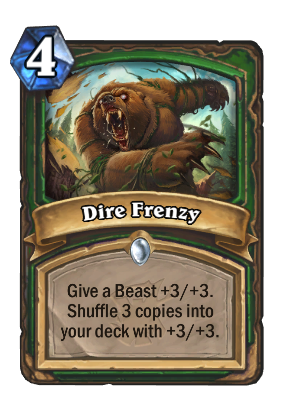 Probably could work in a recruit hunter deck. This + Vicious Scalehide is just filthy. Ok, that is the most pissed off bear I have ever seen. Stonetusk Boar approves of this card. Just in case if anyone missed it, you can also use this on opponent's minion. Hard to imagine a situation when you use this, but this means that you can also copy a Beast from another class. Works well on Queen Carnassa. You get three 11-11 for 5 mana that adds 15 Raptors in your deck, sick value AHah !! How is this gonna work with Stitched Tracker? Is tracker gonna give you a buffed version or the basic version? Hmmm.... Well it's discover a copy. I know that if you discover a copy of C'Thun it only comes out as a 6/6 so you'll get the basic version. Actually I distinctly remember a recent streamer game playing a cthun deck vs priest. He stole buffs from the streamer and got a buffed C'thun from FFA. That said C'thun is a special case where all its buffs read 'wherever it is' so every copy you own would be buffed. Stitched Tracker copies the unbuffed minion, and I imagine it would work the same way with Keleseth. C'thun is indeed a special case, as C'thun buffs are tied to the player rather than any specific copy of the minion. Unfortunately I don't think it will work with Prince Keleseth as he is not a beast. I don't know why, but I love everything about this card. The art, the effect, the possible interactions with tolvir warden. Awesome!! I don't love hunter, but hunter cards always get me the most excited. I will keep Sotha Sil's people alive! Charged Devilsaur somehow got even more fun to theorycraft with.